Manufacturer & Supplier of Dust Collection Systems. Our product range also comprises of Storage Tanks, Roof Air Ventilator and Axial Flow Fans. 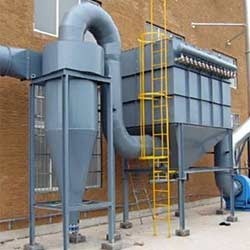 To satisfy our customers, we offer Dust Collection Systems as per their requirements. Our offered products are highly acknowledged in the market for their long functional life. We provide sturdy and rust free Dust Collection Systems to our patrons. These Dust Collection Systems are used for removing dust. Looking for Dust Collection Systems ?